This is a handcrafted bronze ankh made by me. It is solid brass and has a bronze eyelet attached for easy suspension. 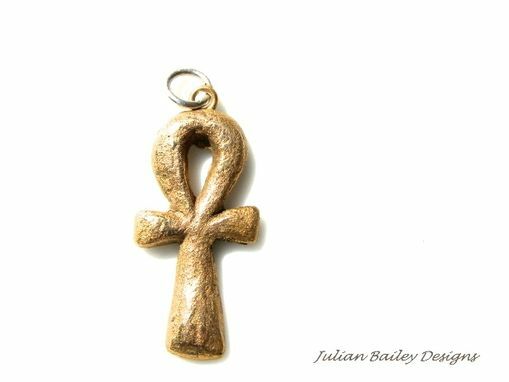 This cool ankh is another addition to the growing artisan charm and pendant designs I am now offering. It is shown with a sterling silver jump ring that may or may not be included based on whether you want it or not. It can also be added to a simple ball chain (sterling silver or gold-filled) for a necklace for you. These are handmade and fired in a kiln the above measurements are a range of sizes that account for natural shrinkage during the firing process.